Much as I love my Black Rapid sling straps I’ve never been 100% happy with them. So I was keen to find out how the Carry Speed FS-Pro 2 measured up. Verdict: There’s no denying that Carry Speed FS-Pro 2 is a well designed and well built piece of kit. The inclusion of a folding, tripod mountable plate is ingenious but only if you fit it correctly to your camera. The Carry Speed FS-Pro 2 is really a strap of two parts. First there’s the very cleverly designed F1 foldable mounting plate and the strap itself and I’ll tell you right now, they’re both brilliant. The first thing I noticed about the FS-Pro was it’s huge shoulder pad and to be honest I wasn’t keen on it initially. If, like me, you normally like your camera gear to be discreet then I’d suggest looking at the Carry Speed FS-Slim as a more subtle alternative. But this strap isn’t trying to hide away, this strap is designed to make light work of carrying heavy cameras and to that end it’s amazing. In fact I’d go so far as to say it’s possibly the most comfortable camera strap I’ve ever used. The comfort factor comes from the shoulder pad being made from a combination of stretchy neoprene and rubber. The strap can be adjusted in length to suit your size, although if you’re particularly tall or wide you might want to contact Carry Speed to check the exact length. On the front of the strap is a couple of D-Rings for attaching links like the included uni-strap which helps spread the load of long lenses by attaching the strap to both the lens and camera body’s tripod mounts. 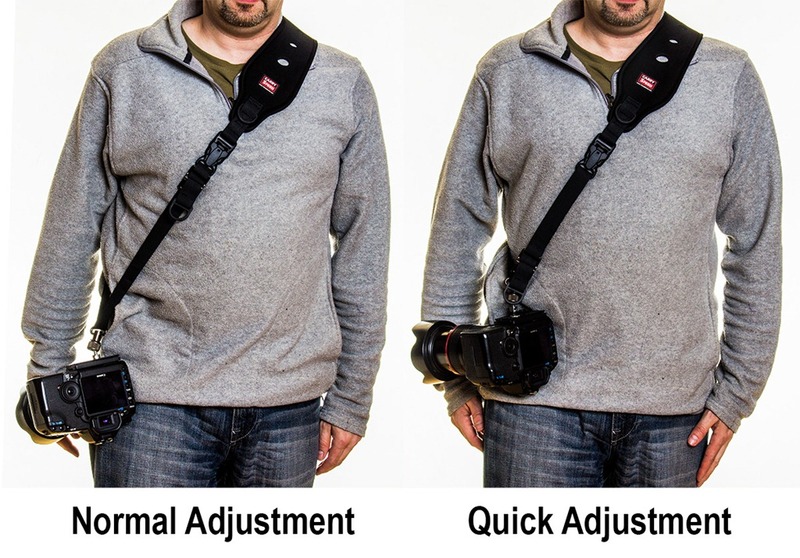 One of my favourite features is the front quick adjustment. Here’s how it works… when I’m not shooting with the camera and I want to keep it close to my body, all I have to do is give a sharp pull on a D-Ring and the strap instantly tightens up. Clever stuff! I’ve used sling straps for years and much as I love them, things like not being able to put the camera down flat are an annoyance. But having to remove the strap before I can use a tripod is probably top of my gripe list. With the F1 mounting plate, Carry Speed have side stepped both those problems because it folds down flat AND it has six tripod holes meaning you can attach pretty much any quick release plate and still use the strap. The design may not be pretty but they work really well. It’s not all good news though. The mounting plate is attached to the strap by a ball and socket which is huge! I also had concerns about the thread on the ball joint unscrewing. Carry Speed have added a rubber O-Ring which is supposed to prevent accidental unscrewing but it doesn’t. Fortunately in all of my testing I didn’t have any issues but I did keep a weather eye on the ball joint… just in case. One really important thing to note is that the mounting plate MUST be fitted the correct way round and as there’s no clues on the plate as to which way is the correct way, it’s easy to get it wrong (just like I did the first time). When the plate is fitted back to front the whole system is worse then useless as the folding ball joint will poke you in the face. Ouch! There’s so much to like about the Carry Speed FS-PRO 2. It’s super comfortable in use, very well made and supports the camera well. I do have some reservations about the design of the ball joint but that’s not enough to stop this strap becoming my “go to” sling strap for use with heavy gear. The Carry Speed does not fit well on my Sony A77, and also cover the battery compartment. The Black Rapid straps are excellent and the RS7 is still my “go to” strap for lighter loads. 3. What about lens security? But in general I found one thing iritating. If I fold the mounting head, then the attached ball joint screw might hit your lens from the side. And that’s not nice. At all. But as long as one is gentle with it, it is fine. When the mounting plate is on, one has to get used to holding the camera, as the left hand grip is kind of different. I’m not used to it yet, but I only had it for a day now, so I presume I will. Overall great piece of equipement! Thanks for a good read! 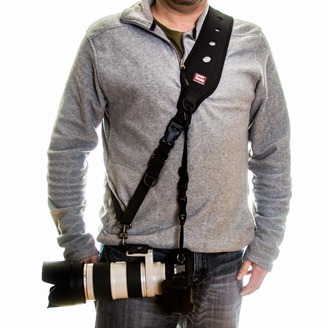 I’ve been on the prowl for a quick strap like this one or the BR RS-7, but have been wanting to find out something I struggled to learn on-line: I’m using a 600D with a no-name battery grip, which over the months has proven very solid and I’ve had no problems with it. My concern is: how safe do you think it is to apply pulling force to the 1/4-20 socket on a grip like that, as opposed to the camera’s own thread? I’ve had horror thoughts of the camera tumbling viewfinder-first onto the pavement, hehe! Many thanks for any insights on this based on experience or your personal preference. Thank you for a fantastic blog and great videos both on GavtTain and for ARTV! Hi Gavin, Looks like another options however I like my Black Rapid RS7 with Brad. On another subject what bags do you use or recommend? I use the ladies’ Black Rapid Strap with the FastenR Tripod (FR-T1) fastener connected to my Manfrotto quick release plate on the camera. All I have to do is unscrew the lock on the fastener and unhook the strap, still round my neck and shoulder, and clip the plate to my tripod – easy! I’ve just come back from a photo tour in the Canadian Rockies, temperatures below zero C, and I found it such an easy way to quickly cope with the camera on a strap, and a tripod. I hate faffing about with these things and this was a good way of dealing with it. You mentioned the strap being a bit on the large side. My maximum carry weight would be my 5D MkII + 70-200 F4 IS, in your view do you think the FS-Slim strap would cope with this combination. If your lens has a tripod collar,then I’d use the FS-Pro. Everything else should be fine with the FS Slim. I found the fastening plate an absolute nightmare for a reason I think you may have missed. When I used a ‘fat’ prime lens (in my case the metal barreled Sony/Zeiss 135mm f1.8) the screw fixing rubbed against the barrel and scratched the paint off. I got around this with a slight modification: Firstly take the camera mounting plate and throw it as far as you can, preferably over a large expanse of deep water (remember to remove it from the camera first 😉 ). Next, unpick the end of the webbing so you can remove the Carryspeed screw fixing and replace it with the excellent Black Rapid CR-2. (Your local cobbler will re-stitch the webbing after if desired). Then use a Black Rapid FR-T1 nut to the camera (via your desired tripod mounting plate), and voila! Black Rapid speed, security and efficiency with Carryspeed comfort. Simples! If you are worried about the ball fixing coming unscrewed paint a little clear nail varnish (I’m sure Sam can oblige!) around the thread, this will hold it firm for quite some time then just check periodically. just put thin rubber plate between mount and the camera. Does the F-1 mounting plate fit on Nikon D7100? Because I have a C-3 mounting plate and it is too small for d7100. Hello. I just purchased a New Prime Series FS-Pro and seems to be easy to use, and fits my D7100 like a glove. The ball to socket is a bit clunky on the new design, but not a show-stopper. To stop the ball head from ever coming loose, I put a small amount of thread locking compound (Locktite 242) on the threads. One comment: I am a tall guy and the camera does not sit on my hip as I hoped. Is there a longer strap set available for us taller guys? Probably another 6 to 12 inches would be ideal.